Toxic Algae Blooms have already started showing up on the East End. 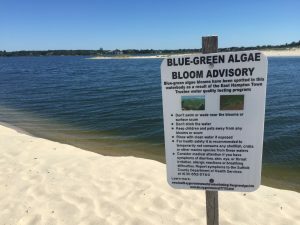 Bloom conditions are already present in Wainscott Pond, while toxin levels in Wickapogue Pond have just subsided below advisory levels. No advisories yet for any other ponds that we are aware of but be smart and keep your dogs and kids out of these waters. These toxic blooms which have been plaguing our local ponds are caused by cyanobacteria, or blue-green algae, which are microscopic organisms found in marine and fresh water environments. They are usually present in low numbers, but under favorable conditions of sunlight, temperature, and nutrient concentrations, can form massive blooms that discolor the water and often result in a scums and floating mats on the water’s surface. Some species of cyanobacteria produce toxins that can cause health problems in humans and animals if exposed to large enough quantities. How harmful are these blooms really? Skin contact with the organisms can cause irritation of the skin (rash or skin blisters), eyes, nose and throat, and inflammation of the respiratory tract. Swallowing water containing high levels of toxin can lead to nausea, vomiting, abdominal pain and diarrhea. Effects on the liver and nervous system of animals and people have also been documented in severe cases. Livestock and pet deaths have occurred after these animals consumed large amounts of algal scum that had accumulated along shorelines. What is causing these blooms? Too much nutrients, nitrogen & phosphorous getting into our waterways is over-fertilizing the algae populations and causing these dangerous bloom conditions. These excess nutrients are coming from inadequate septic systems that most businesses and residences on the east end depend on to treat their wastewater. Even when the traditional septic systems that are currently accepted by the Suffolk County Department of Health are actually situated and functioning properly (which is not the case in many areas near the water with a high ground water table) they still don’t remove nitrogen from the wastewater before it seeps into groundwater, which eventually travels to our ponds, bays and ocean. Residential and agricultural fertilizers are also making their way into our waters and contributing to the algae problems that cause conditions toxic to fish and humans alike. Now is the time for the Suffolk County Department of Health to take appropriate action to this growing public health crisis and approve the installation of new septic technologies that will function properly on the east end and stop polluting our local waters with nitrogen. The technology exists and is being used in other states, and its time for the County to really push this thing forward. We can’t keep sticking our heads in the sand and ignore the massive problems that excess nitrogen in LI waters is causing.